It would be interesting to see if the circuit is identical. The pinout looks similar, but the AA Batteriser has 2 inductors. Could you measure if both inductors are connected in parallel or if there are two independent boost conveters? You probably have to remove one inductor when doing the measurement, because both inductors are connected to the same input voltage. You measured they are not connected? Assuming pin 1 is top left pins 3 and 6 and 4 and 5 being common would explain AAA and AA layouts. If pins 3 and 6 are not common then maybe it is some kind of bi-phase converter. If the second channel behaves identical to the single channel one on the AAA Batteriser, the maximum output current should be around 1.5A. Operate both channels at the same time, are they interleave or is the second channel only enabled at higher output currents? i found 30 mins or so today to do a little testing and measuring. Both PSUs have the sense wires connected, PSUA has them inside the beige box to the banana posts, PSUB has them to the back of the banana plugs. So there will be some losses in the bits in between like plugs, clip, wire to the batteriser etc (see the attached pic). 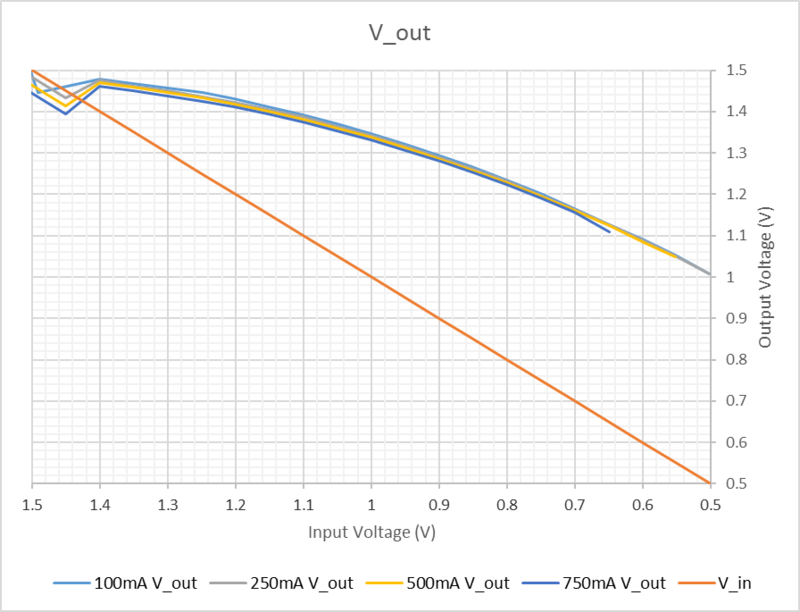 At 125mA load the batteriser wont startup below 0.6v, but it will continue to run if it's running and you then reduce the V_In, the lowest i measured to was 0.5v, i figured there would be little point less than that anyway. If it doesn't start up, it just passes through V_In to V_Out. I should have a little time tomorrow to do some more, if anyone has a specific suggestion or spotted a mistake i've made let me know. Hopefully it should correlate to other peoples measurements! I think your efficiency calculation is wrong. You should solder the sense wires to the Batteriser. I measured 1.418 V for 1 V input, at 100 mA. 78 mV difference compared to your measurement is a bit high, maybe I did something wrong, too, but to be sure it should be done right. I guess there is some variation, which might be a good idea to measure, too, but 5% (relative to 1.5 V) is a bit high. My multimeter should measure much better than 1%. This is really the most important voltage range, it's 80%(ish) of a normal battery's life. Edit: Nope, your sums are wrong. (1.44*0.126)/(1.25*0.16) = 90% efficient. Thank you dexters_lab... Perhaps the same type of testing repeated but at various different load levels, like 500mA, 1A, 1.5A, 2A... See how it performs under some real load! Cheers! Thanks for measuring. Corrected the last column for you. Results are similar to Frank's measurements. OK, now we need a graph of that with overlaid graphs at different currents. thanks, i always make a goof somewhere, i'll edit my post! The patent mentioned ~1.34 volts on the majority of devices as cutoff if I remember correctly. Meaning if the battery is at 1V (depending on load) it will not work anymore. So until 0.8V the energy left is "untapped" . So much for "extract all energy". i opted not to change my setup, the sense wires are soldered into my banana plugs on PSUA, you might be able to see the small white sense wire tucking into the back of the plug in the pic, it would mean cutting them or fiddling around the back of the PSU to attach other sense wires and i don't really want to do that. What i did do though is reduce the length of my wires to the batteriser, made sure everything had a good connection etc and started again from scratch, so there should be a small improvement in the losses. So my sheet now has 100mA, 250mA & 500mA, i also un-rounded the numbers and corrected the efficiency calculation and dropped them into a google spreadsheet. Of course I wasn't serious, but the test is to compare the power output of the two devices, so the added weight means that the train running times/laps are not 100% comparable because the trains have different weights. I'm pretty sure the Batteriser weight would be within the normal weight tolerance of the batteries themselves. Charts of Dexter's data attached! Actually looks far more interesting than I thought it'd be. The Input/Output voltage graphs for all 3 graphs have the exact same shape, so exact that after making the first two I had to double-check the tables to make sure I hadn't copy+pasted something wrong. Of course, this is running off of a high-grade power supply, and as we all know from Batteroo, you can't simulate a battery with a power supply because that ignores the batteries internal resistance. Never mind the fact that adding the IR into the model will make the sleeve perform far worse than these ideal characterizations. Don't worry yourself over such a minor detail. Yes, I really do appreciate the testing and it's yielded some interesting results, but from experience, you can get pretty inaccurate results due to voltage drop if the sense wires aren't exactly at the point of measurement. It's really the whole point of having sense wires. But having said that, I was quite impressed by the performance of the sleeve under this test up to 500mA at least. Good efficiency curves. Thanks to the user JiggyNinja who created graphs. I'm still curious to see how it does with a real load on it. Lots of devices powered by AA cells will draw 1A, 2A, and upwards. You can turn the train upside down, have a roller "road" (track on a spindle also upside down). Though technically, due to the testing location, by some reference frames, the test was already upside down! I took the time out just now to re-wire the setup so i now have the two PSUs connected with the sense wires right onto the batteriser PCB, i verified it with my bench DMM and can't see any appreciable difference from my bench PSU display so this should be as good as i can get it with the equipment i have. i removed the entries when the batteriser shuts down, so you'll see the 750mA data only goes to .649v as that is the lowest i could go. I think the results, the batteroo performance, looks pretty good from this data. is there anyone else doing similar testing to confirm/reproduce? 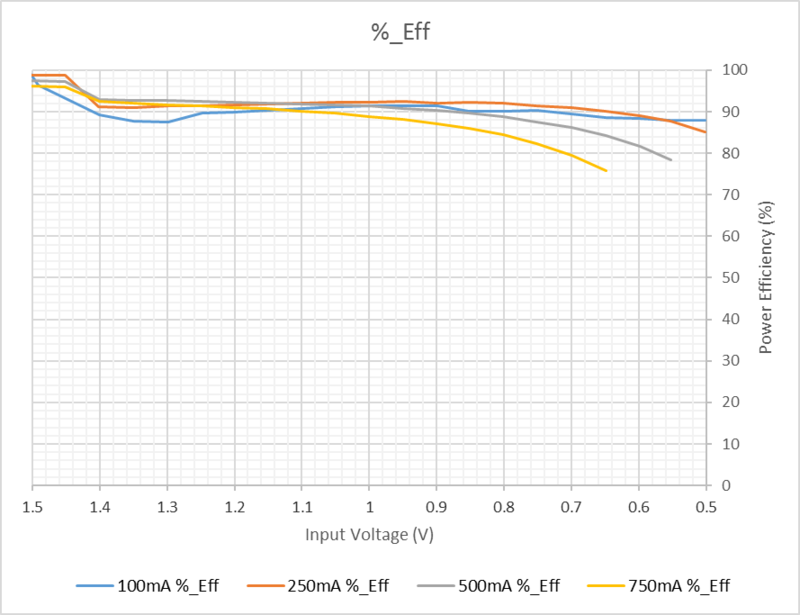 The results look plausible: Since the boost converter always works in PFM mode, the duty cylce and peak current are constant over the load range, therefore there should be almost no change in efficiency like the typical curve you see in the more common PWM mode boost converter specs. The slight drop at high current and low input voltage is probably the voltage drop at the input wires, because you didn't connect the sense wires directly at the Batteriser pcb.